Wow, Podcast Movement in Philly was a BLAST. I felt so energized, and my creativity was buzzing just being surrounded by so many like-minded individuals. It was wonderful to share in this experience with my husband, who has been growing his podcast production company from the ground up for the past two years. I've been in awe watching his business take-off and it has been such an inspiration for me! They are now up to 51 one shows and counting, from all across the country, and I couldn't be prouder! Meeting his production team in person (two of them are from England) was also a huge highlight of this trip. I highly recommend taking a walk to Old City. The houses are beautiful, there are a TON of restaurants and bars, and some beautiful parks to relax and enjoy. 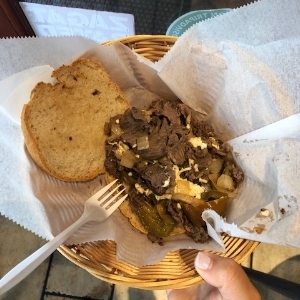 Oh, and if you're looking for a Philly cheesesteak that accommodates your dietary needs -- Campos has you covered. Vegan, gluten-free, and dairy-free options available! If you're looking for a nice coffee shop in the area, I really enjoyed United By Blue. It has a modern chill vibe with tons of greenery. The perfect setting to get some work done or chat with a friend! After you grab your coffee, take a walk on up to Market street (where Campos is located) and check out all the restaurants and bars. If you are an "It's Always Sunny in Philadelphia" fan, you HAVE to go to Mac's Tavern, which was formed by Rob and Kaitlin McElhenney from the show. Great drinks and typical bar food. If you're feeling a beautiful outdoorsy scene, grab a bite to eat at the lovely Talulas Garden and then take a walk around Washington Square Park. I absolutely loved looking at all the beautiful houses and history that area of the city had to offer. Wherever I go, I try and find the water! Good thing Philadelphia had the lovely Spruce Street Harbor for me to enjoy ;) Spruce Street Harbor was really pretty, but the best part was relaxing in all the hammocks! There is typical food truck food and drinks (yep, beer too!) and games to enjoy along the boardwalk as well. If you're in Philadelphia you HAVE to go to the Reading Terminal Market. 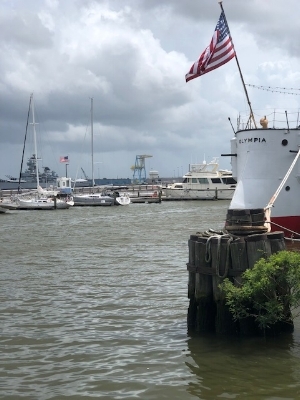 It's one of America's largest and oldest markets and was founded in 1893. If you're looking for a wide variety of food options, and some fun shopping, Reading Terminal Market has you covered! There was so much to choose from, but I was ALL ABOUT the gluten-free and dairy-free corndogs (vegan options available too) from Fox & Son. 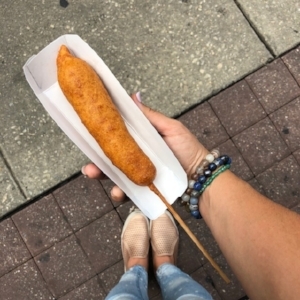 And you don't have to stop at your corn dog, grab a classic or vegan funnel cake while you're at it, too! The Reading Terminal Market has too many options to list, but you can find anything from grass-fed burgers, vegan munchies from the deli, or juice bar from their juice bar. Have fun exploring! Oh my gosh... Goldie! If you love falafel this stop is a MUST. It's also 100% vegan. Salad, sandwiches, fries, and even a falafel smoothie. YUM. I didn't make it to these places, but wish I would have! Good thing I'm going back this weekend for the GOOD FEST!